Our Laguna Niguel location features all drive-up units that don’t require elevator access. We offer wide driveways to accommodate big trucks. Conveniently located off the I – 5 freeway at Crown Valley Parkway between Forbes & Cabot, right next to Costco. This secure, safe and locally owned facility offers storage units ranging from 4×5 to 20×25 for your personal and business needs. 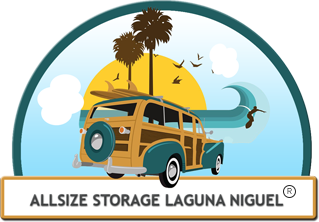 We provide self storage services to residents in Laguna Niguel, Laguna Beach, Laguna Hills, Aliso Viejo, Mission Viejo, San Juan Capistrano, Dana Point, San Clemente, Capo Beach, and surrounding areas. Reserve today to lock in your best rate, no obligations, all month-to-month leases. Approximately 35 standard file boxes, or good for small furniture pieces, futon mattresses, and/or folding tables, chairs, electronics, cabinets, small surf boards, and sporting equipment. 50% Discount for up to 12 Mo. 35% Discount for up to 12 Mo. The size of a 1 Bedroom or Studio Apartment, or a typical office suite. Approximately 85 standard file boxes or great for storing a mattress set, small dining room table, couch, chairs, outdoor furniture, garden tools, bicycles, motorcycles, and small ATVs. The size of a 1 Bedroom or Studio Apartment. 50% more space than the 5x10, but, you will not pay 50% more in a rental rate. Approximately 150 standard file boxes, or this unit is good for storing a large dining room table, couch, chairs, and a mattress set. 2 Bedroom apartment or for a full living room. This is the most popular unit size. Approximately 180 standard file boxes. Or good for bedroom sets, large dressers, a refrigerator, or a small water craft. 2 to 3 Bedroom house or large apartment. The size of a one car garage. Approximately 290 standard file boxes or great for large items such as pianos, sofas, appliances, small cars, and multiple bedroom sets, business merchandise or long items such as rolls of carpet, ladders, etc. 20% Discount for up to 12 Mo. Full Garage or 3 to 4 Bedroom house. Great for storing average sized cars, trailers, small boats, multiple bed room sets, sofas, large appliances, and multiple boxes. 4 Bedroom House or extra Large Garage. Great for storing furnishings, appliances, sofas, multiple boxes and bedroom sets. Or can hold a car, truck or boat. Great for holding cars, trucks, boats, household furnishings, large appliances, sofas, multiple boxes, and bedroom sets.